The BLACK+DECKER 54 Volt lawnmower has enough power for even the toughest of lawn mowing tasks. Change batteries without losing power with the revolutionary POWERCOMMAND Functionality. 3-IN-1 grass collection - Mulching, Bagging and Side Discharge. 7 Setting Height Adjustment - Single lever control adjusts heights from 38-100mm. 48cm deck - Suitable for large lawns. Compatible with all BLACK+DECKER 18 Volt Lithium Ion tools. Supplied with 2 x 2.5Ah battery and 2A Charger. The BLACK+DECKER 54 Volt lawnmower can automatically sense the load and operate at the optimum level for the task using AUTOSENSE Technology. Cut lawn edges with ease using the mowers EDGEMAX Design. 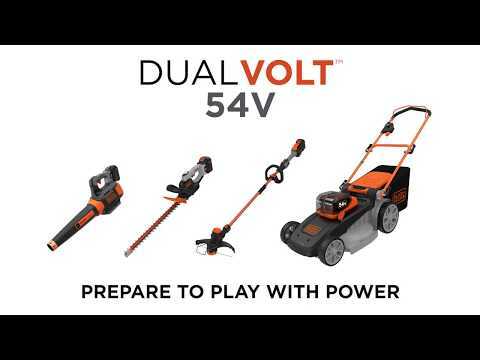 Part of the DUALVOLT power garden range.